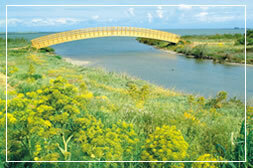 “Su Livariu” is situated 7 km away from Oristano and 2 km from the main road ss 131. 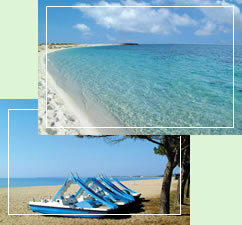 It is close to the beautiful beaches of Torregrande, of S.Giovanni di Sinis and of Is Aruttas, famous for its white quartz sand. 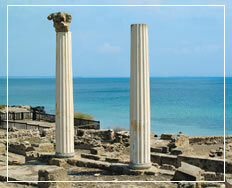 Other places to visit are the archaeological sites: the ruins of Tharros, coastal town of Phoenician origins . 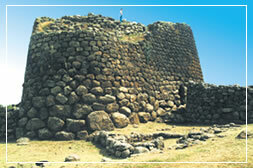 “Nuraghe Losa”, the important fortress tri-lobed (Abbasanta). 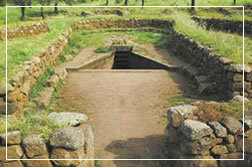 The Well Temple of “S.Cristina” (Paulilatino), the most important sacred spring in Sardinia, where “the cult of water” was worshipped. 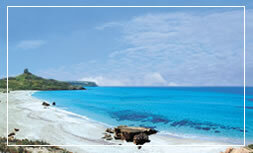 Places to visit in the area are the lagoons of S.giusta and of Cabras nearby, where it is possible to see the old fishermen at work in the early morning; or the natural oasis of Turr’e Seu, where you can walk through the narrow paths that take to Monte Arci. There you can enjoy the beauty of unspoilt woods and you may even find the dark obsidian, a type of volcanic stone that used to be a trading object in ancient times.Activities such as horse riding excursions, tennis swimming and golf are readily available. During the Carnival, in Oristano there is the “Sartiglia”, old equestrian celebration that reports the ancient belief that the fertility of the land depended upon the number of stars strung together by the riders.